June 5, 2005: a team of British divers located an American submarine in the Golf of Thailand, missing since just before the end of the Second World War. Eighty-six men were lost with the U.S.S. Lagarto. One of those was William Mabin, a lifelong resident of La Grange and graduate of Lyons Township High School. He was also the father of La Grange resident and longtime member of this historical society, Nancy Kenney. She was just two years old at the time of her father’s death; and, for sixty years knew him only through the stories and memories shared by friends and family. With the discovery of Lagarto, came what Kenney describes as an almost obsessive desire to uncover everything she possibly could about the parent she lost; and, in doing so, to honor him. 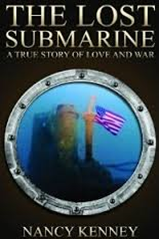 The Lost Submarine: A True Story of Love and War, is Kenney’s account of her courageous journey to connect with other Lagarto families, to plan a memorial service in conjunction with the Wisconsin Maritime Museum, and, to find her father. Enter Margaret Miles Mabin, wife of William Mabin, mother of Nancy Kenney, and also a La Grange resident. The Mabins, like most couples during wartime, exchanged letters with one another for the duration of the time they spent apart. For years, despite encouragement from her mother, Kenney was reluctant to read her father’s letters believing they would make her sad. When asked if reading them was as difficult a task as she thought it would be her response is an emphatic, “No, totally the opposite. The letters gave me self-assurance of my father’s love for me.” Mabin had hopes and dreams for his daughter. He hoped, perhaps above all else, to become a permanent fixture in her mind. He worried that he would be a stranger to her because of the time and distance between them. The Lost Submarine, shares with readers the courtship, love, and marriage of the Mabins. It tells also the story of life as a submariner on patrol somewhere in the South Pacific; and, then, of a loved one’s vessel turning up “overdue and presumed lost.” While the story paints a portrait of pain and loss it is always balanced with the optimism of the present wherein we are privy to Kenney’s progress to obtain recognition for those lost with Lagarto.